Investing in outsourced IT resources can be confusing if you aren’t exactly sure whom to call or what you need. There are a lot of buzzwords that are bandied about that make the process of picking the right IT service partner even more difficult. 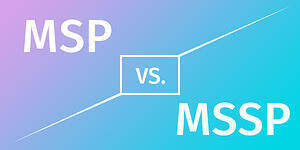 In particular, the difference between an MSP and an MSSP is difficult to understand. Here's an explanation of what MSPs and MSSPs do and how to choose the type of IT company that’s right for your needs. MSP stands for “managed service provider.” MSPs hold an operations focus – taking care of your production systems and helping you with projects, like migrating content to the cloud and overseeing email. An MSP will monitor all of your technology systems from a holistic vantage point, making sure everything is up to date and functioning well. Not all MSPs are created equal. Some MSPs also consult on IT strategy, helping you plan out your technology systems, equipment and software from a business point of view, while others specialize in specific services. Many MSPs also help with security concerns – for instance, recommending, installing and updating things like firewalls and antivirus software. But as the sophistication of cyberattacks becomes more intense, companies today are focusing more closely on security. MSSPs have arisen from this trend. MSSP stands for “managed security service provider,” and as the name suggests, this type of IT company has a particular and sophisticated focus on security. MSSPs offer more robust solutions that look at the security of your overall environment, aiming to bolster it with proactive solutions and reactive remedies. For most MSSPs, this sort of informed oversight begins with a deep understanding of current policies and regulatory compliance issues that might affect your company and your data. For instance, if your company is in the medical industry, your MSSP should have a solid understanding of current HIPAA privacy rules so it can make recommendations for protecting your data and instituting appropriate practices. An MSSP’s role in your IT ecosystem is highly specialized and can be critical to protecting your data and your brand. Ultimately, to get the best possible IT service, you need not only an MSP that oversees your entire IT operation, but also an MSSP with an informed hyper-focus on your security. If you can find both in one company, even better. Contact us today to discuss how to move your business forward more securely.